Late during my previous day in Busan, after having spent the afternoon exploring Gamcheon Culture Village, I had learned that Typhoon Chaba was going to be hitting South Korea overnight. The bulk of the storm hit in the early morning hours, but by the early afternoon, the skies were clear. I had spent the storm bunkered away in my hotel room in a sturdy concrete love hotel near Beomnaegol station. 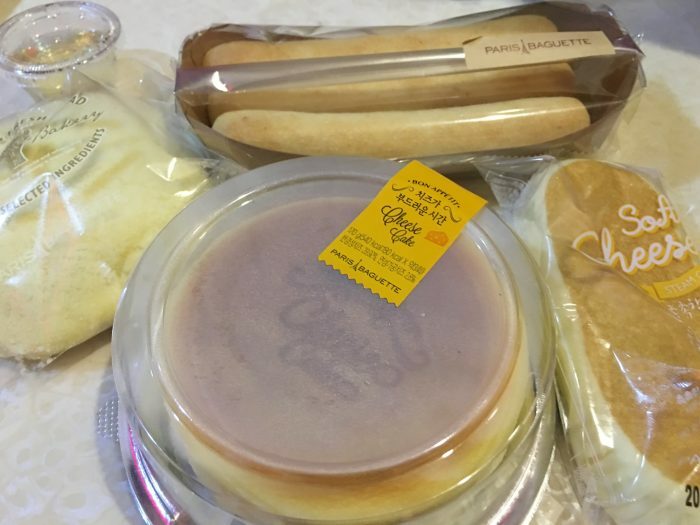 I had prepared for it by buying a ton of baked goods from Paris Baguette. Venturing out, it was clear the typhoon had been strong. 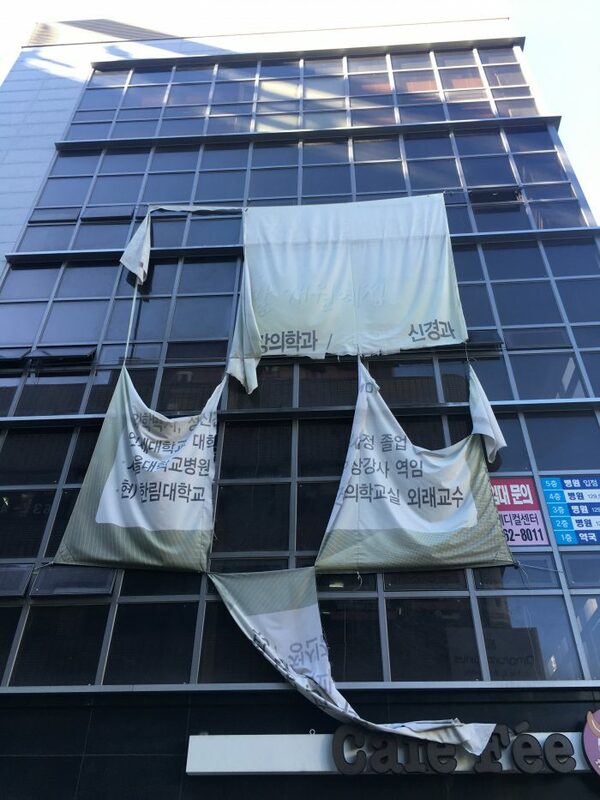 Torn banners hung from buildings, and power lines dangled dangerously over streets. Despite this, life was beginning to return to normal, and it seemed that most places in the area had power. 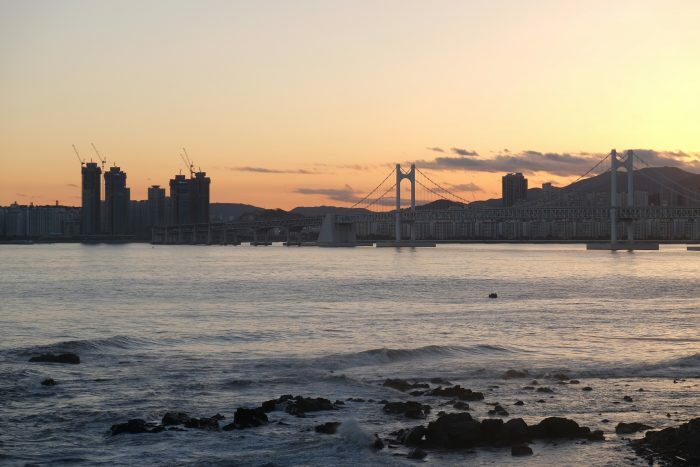 Before I had learned that a typhoon was coming, I had decided to heard out to coastal Haeundae & Dongbaek Park that day. With the weather now looking fine, I figured it would still be a nice place to go. I took the metro out to Haeundae station. 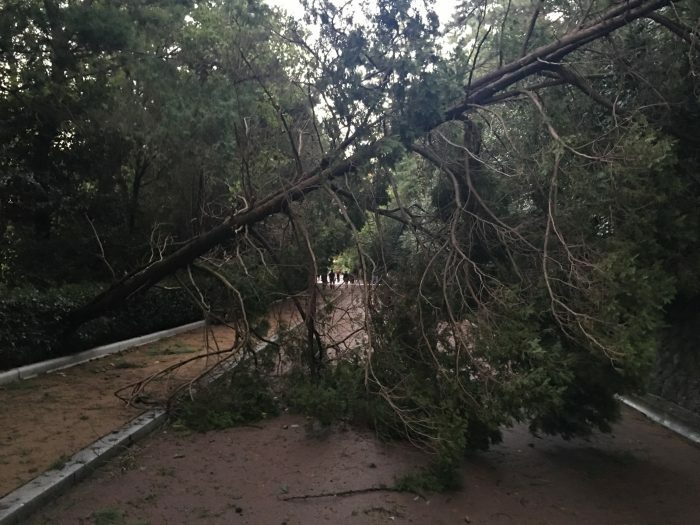 Leaves & branches littered the streets, but there wasn’t heavy damage. The area is known for its bars & restaurants, but was quiet, since it was the middle of afternoon following a storm. I realized I hadn’t eaten anything other than Paris Baguette, so I went for a dolsot bibimbap (hot pot bibimbap) at a place called Gimbapcheonuk. I was happy to finally see something on a menu that was served for just one person. 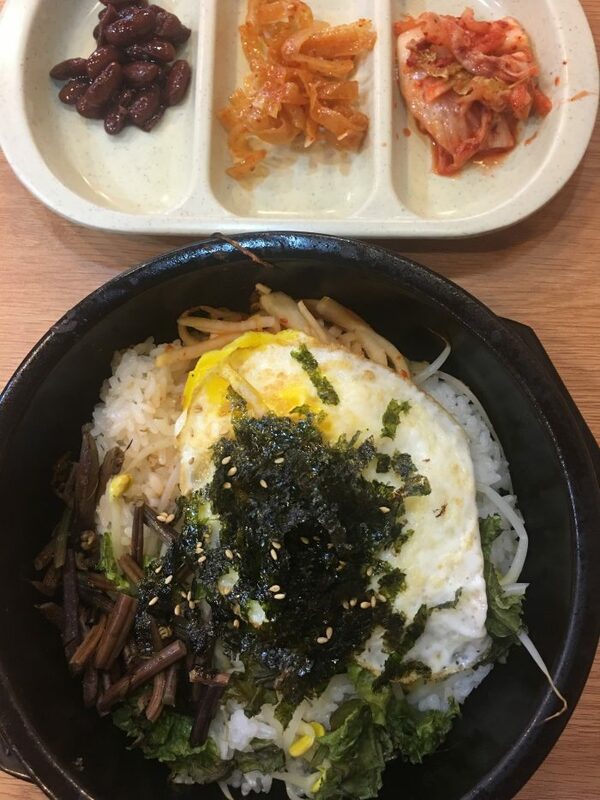 The only issue I had as a solo traveler in South Korea was that so many places serve food in communal settings, with pricing for two or more people. This is fine if you’re with friends, but when you’re alone, your menu choices are much more limited. After my late lunch, I walked to Haeundae Beach. Initially, there were few signs that a super typhoon had just passed by. 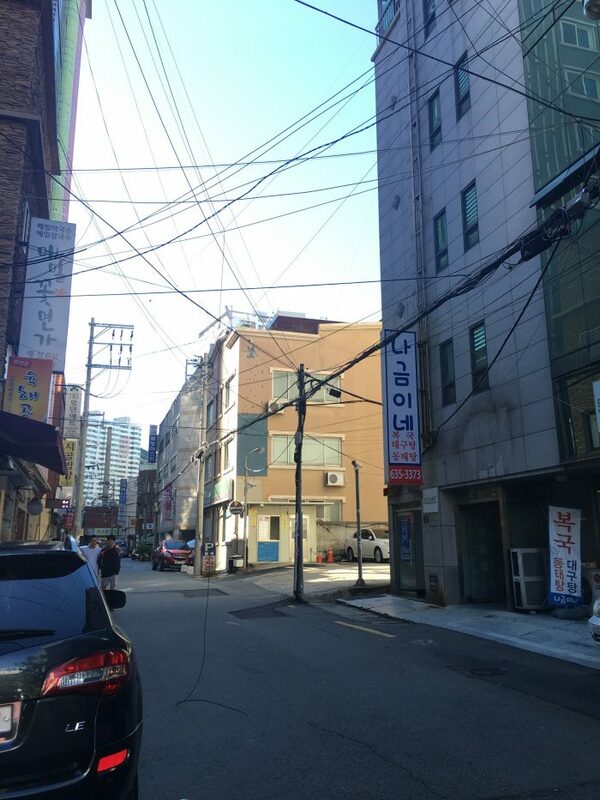 In fact, the weather was the nicest I had seen so far in South Korea. The skies were blue, and the air was clear, helped by a nice breeze. 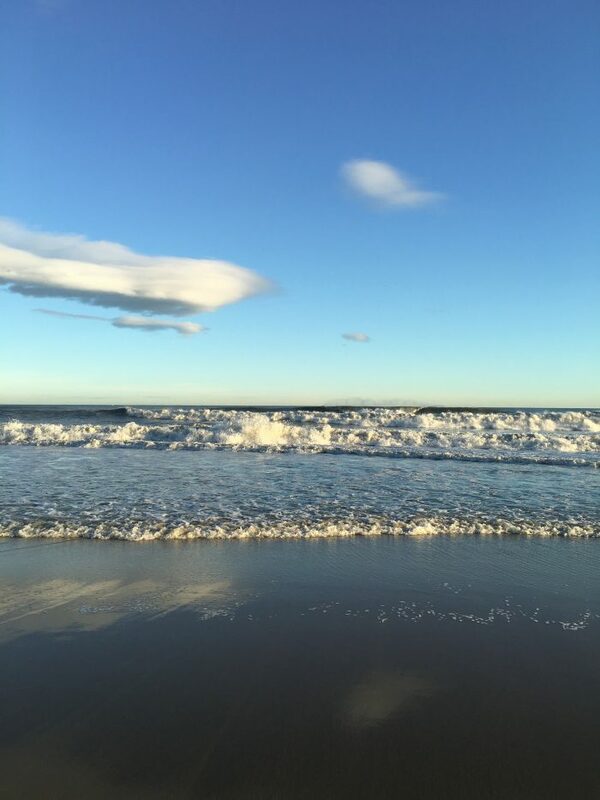 I continued walking along the beach towards Dongbaek Park. This stretch of beach had more signs that there had been a storm. 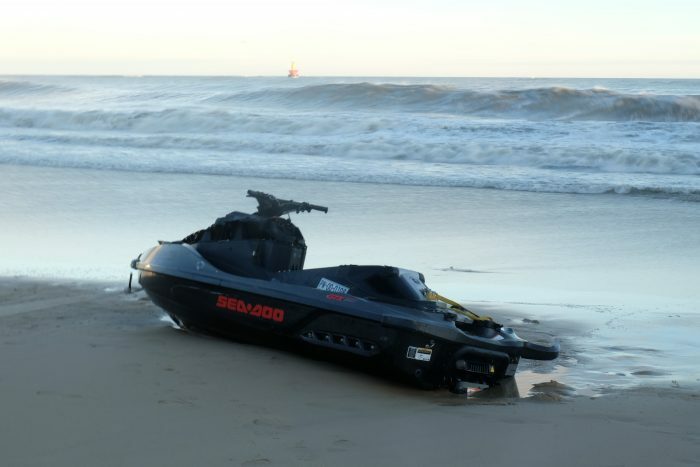 There was a dead jet ski that had been washed well up on sand. I hoped it had just become unmoored from somewhere. 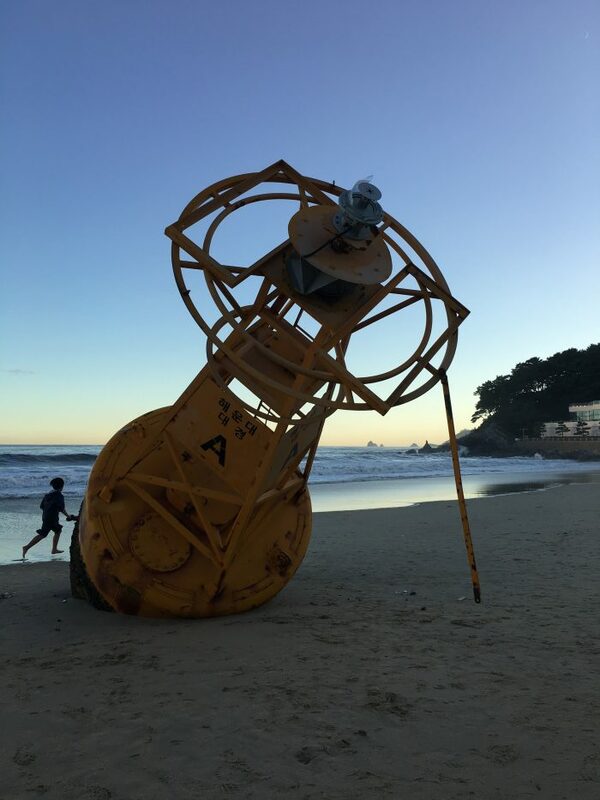 Further down the beach, there was a massive buoy. 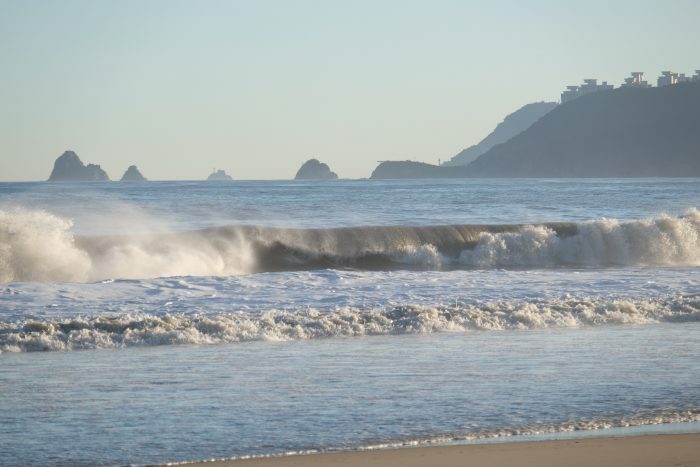 Perhaps it had been here for a long time, but whenever it happened, this is a testament of just how powerful the ocean is, if this heavy object had made it that far from its home. 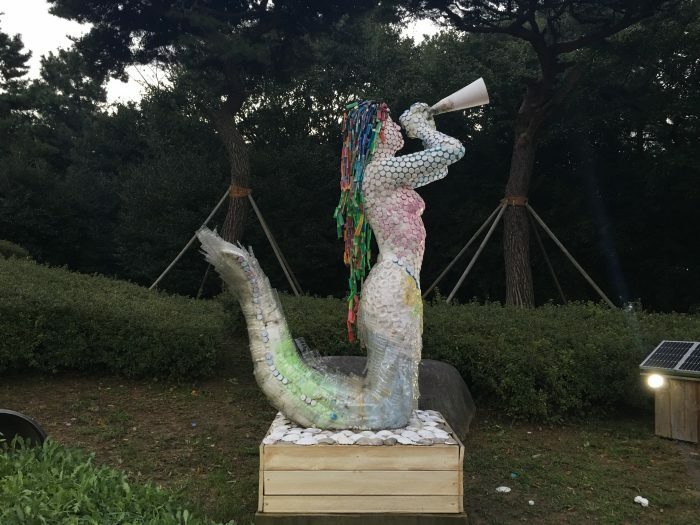 I found myself at the entrance to Dongbaek Park. 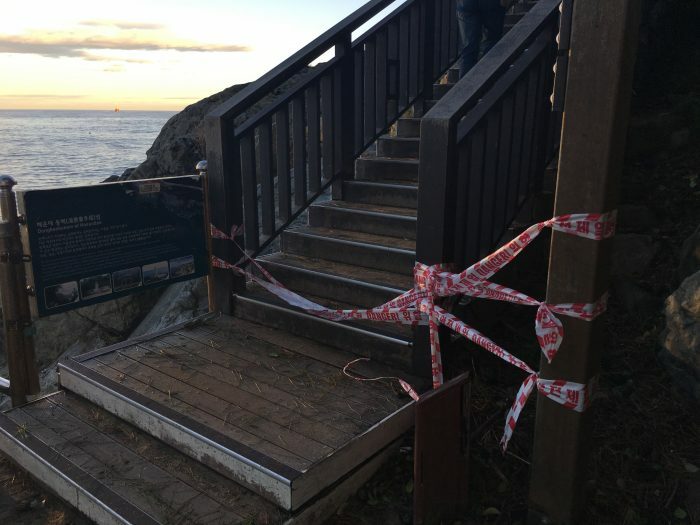 Yellow tape had somewhat roped off the stairs, but everyone else was ignoring it, so I did too. 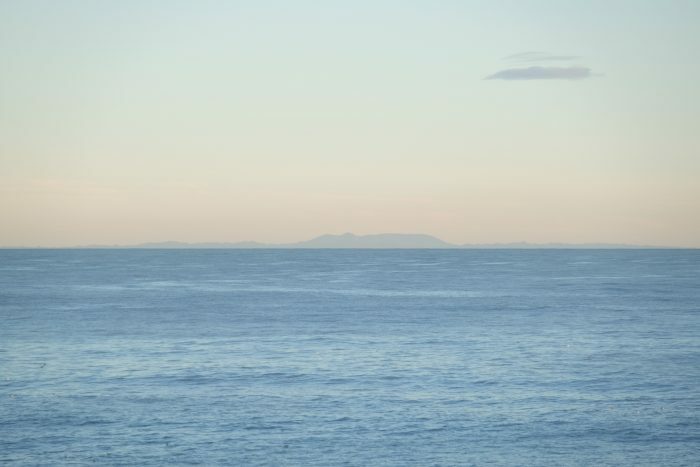 From the cliffs above the shoreline, you could see all the way to Tsushima Island. 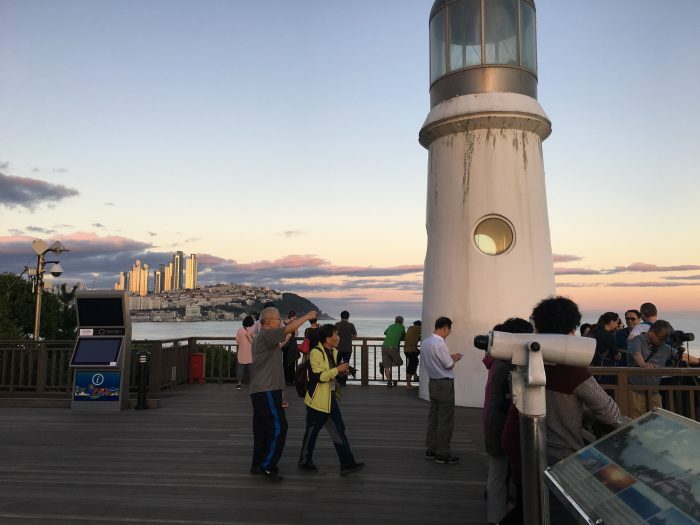 The island is 50 kilometers away from Busan, but thanks to the island’s 2,000 ft mountains, it can be spotted on the clearest days. They are only visible about 60 days per year, and this happened to be one of them. Dongbaek Park reminds me of Land’s End in San Francisco. You’re so close to a dense urban center, yet you’re also in this beautiful natural place. The sun was starting to set. 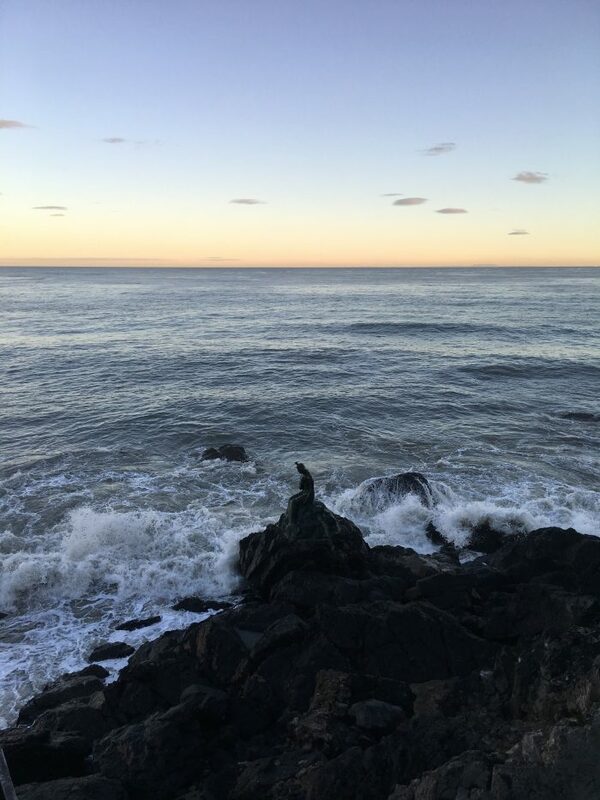 Between the cliffs, the trees, and the waves, it was a gorgeous sight. Near the southern tip of the park, there is a lighthouse. The area was crowded with people out enjoying the sunset. With the skies lit up all around me, I could finally see the massive Gwangandaegyo Bridge, as well as all the tall buildings around the bay. This side of the park has wider paths, but also more trees. One of them had fallen during the storm, requiring visitors to duck under it in order to continue their walks. 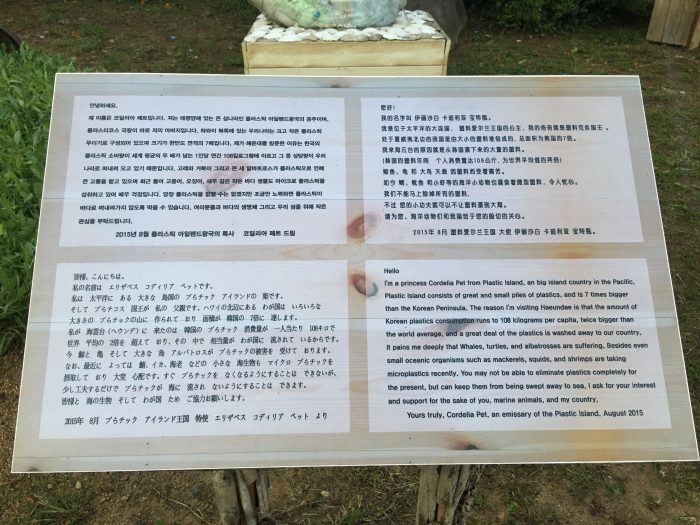 Near the exit, there was a statue that had been installed to warn people about the dangers of dumping plastics in the oceans. I have been seeing more and more similar art around the world, which is good since it’s such an important ecological issue. I found myself back at the Westin Chosun Busan hotel. 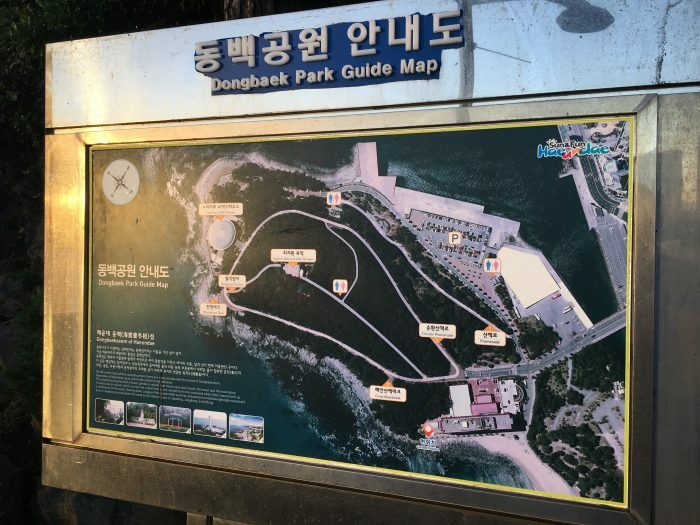 Thanks to Dongbaek Park being on a peninsula, you pass the hotel no matter which way you enter. If you are staying in the hotel, make sure you venture into the park. From here, I headed to Dongbaek station to spend the rest of the evening checking out Busan’s craft beer scene. The whole area has lots of different things to do, whether you want to be inside eating & drinking or relaxing in parks or on the beach. 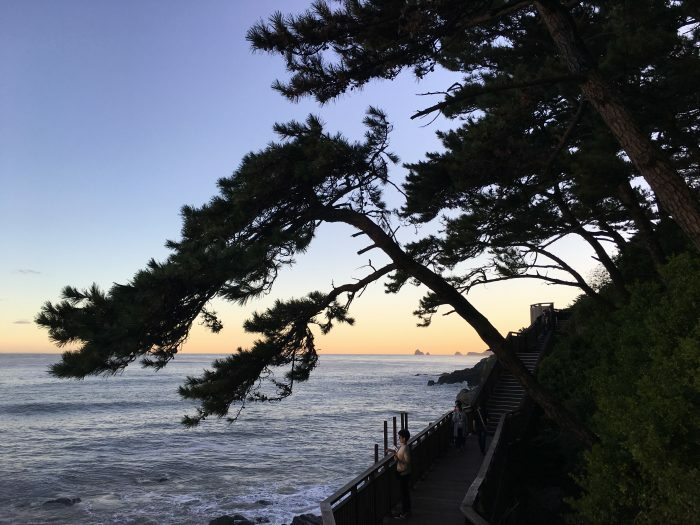 The loop walk from Haeundae station, through Haeundae & Dongbaek Park, then to Dongbae station only takes an hour or two depending on how many diversions you take, but it’s a pleasant walk. 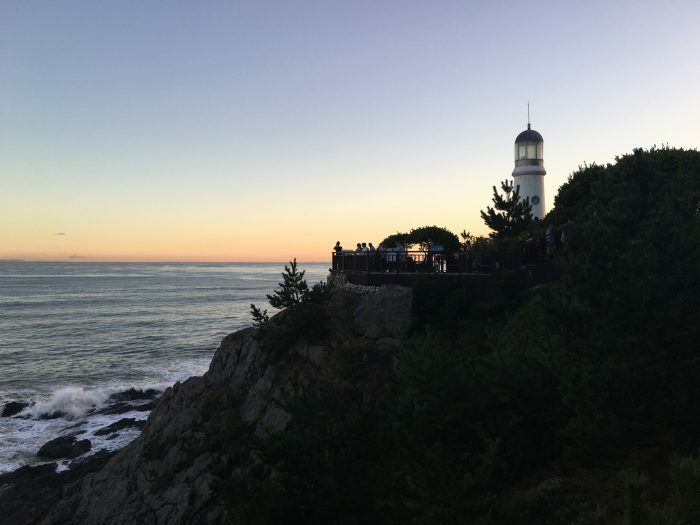 Haeundae & Dongbaek Park were some of the most beautiful areas I saw in South Korea. 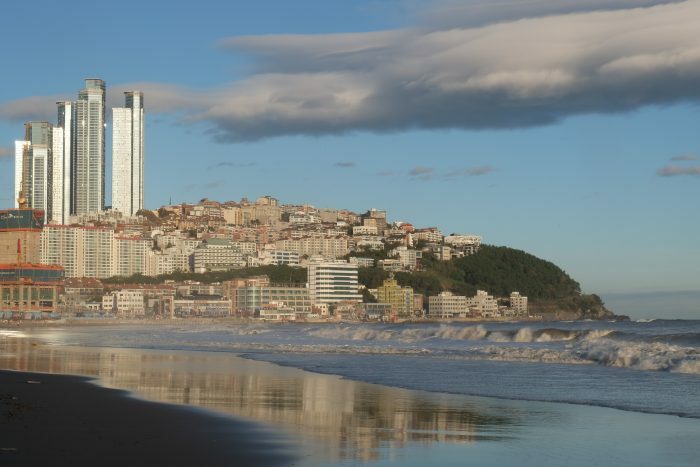 The area is worth visiting for its beach & nightlife, but it’s also a nice place for an urban walk. 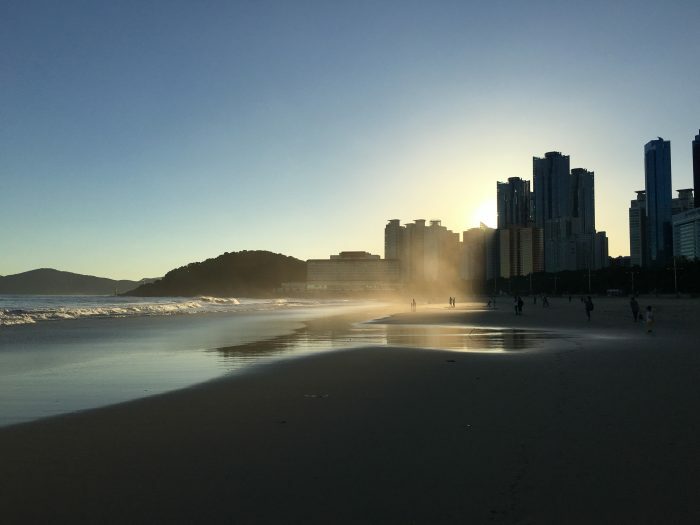 If you’re looking for a break from the urban bustle of Busan, Haeundae & Dongbaek Park make for a perfect escape.